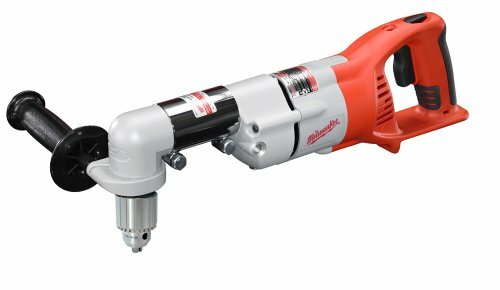 The Milwaukee 0721-20 Cordless Right-Angle Drill is ideal for boring large holes in between studs, joists or in tight areas. 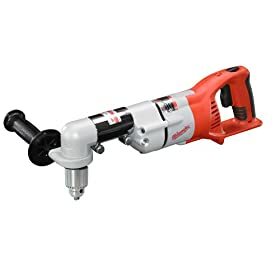 This tool is great for plumbing and electrical applications such as drilling holes to run wire through studs and joists or boring holes in floors for plumbing venting. The Milwaukee 0721-20 is powered by a 28 Volt Milwaukee high power motor. The tool features an extremely rugged motor and gear train that is capable of handling some of the toughest jobs and is durable enough to withstand job-site abuse. This monster has a 2-9/16 in. capacity when drilling 2x material with a self-feed bit. It also has a head and handle that can swivel 360 degrees and be locked tight into any position. The 0721 has a variable speed trigger that allows for controlled starts and features a convenient forward/reverse lever for easy use.